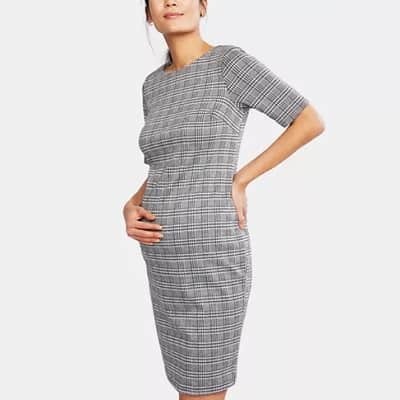 A similar dress in plus-size maternity isn’t proving easy to find, but Motherhood Maternity has an option for a patterned plus-size nursing dress. How do you guys deal with the “my baby loves his daycare teacher/nanny/au pair more than he loves meeeeee” feelings? (in my particular case it is my 14mo’s daycare teacher, who to be fair is objectively amazing and I am so grateful for her, but it’s tough when he lunges out of my arms in the morning as soon as he sees her). I just remind myself that there are WAY worse problems than being reassured each morning that my child feels happy, safe, and loved in the place that she spends her days. I know it’s not that easy, but after having some less-than-stellar childcare experiences with my first I find it easier to reframe my thinking to a place of appreciation with my second. I just try to congratulate myself that I did such a great job picking her caretaker… haha! Does he also run to you at the end of the day? It’s a relief to me that my kid clearly likes her nanny and is excited to see her. I’d be bummed if she wasn’t also excited to see me in the afternoons though. Fun fact: My preschooler goes through phases where when she sees me at pickup she bursts into tears because she is having SO much fun doing her activity and doesn’t want to leave. It’s not the greatest, but it does make me feel good that she likes her class so much. We’ve gone through periods of her hating school, and that feels much worse to me. +1 My kid burst into tears when I showed up to take him home the other day because he had just started playing trains and wanted more time with them. I was happy to watch him play for a bit and imagine that he’s that happy all day. *raises hand* My preschooler often ignores me when I walk into his classroom, or he’ll glance up at me and then immediately return to whatever he’s working on. I’ll sit and watch while he finishes building a house, or completing a puzzle, or whatever. I do think daycare pick up is different from returning home. When we had a nanny, same kidlet used to stand by the window and watch for me to come down the block! Mantra: The more loving adults in my child’s life the better. This can be applied to childcare providers, grandparents, aunts and uncles, teachers, coaches, and friends’ parents who are just SO MUCH COOLER than you. These extra adults are great – helpful to you and good for your kid to have relationships with grownups who are not you. But even if the kid never realizes it consciously, you are the ground beneath their feet, the one they cry for at night, the one who makes the decisions about their life, the one who is their foundation in life, and barring some extreme circumstances, other adults will never change that. Be relieved that your kid loves daycare – you really would feel much worse if she was screaming her lungs out and pressing her face against the glass as you left the building. Your kid needs love from more than just you, and you should be proud that you’re raising a well-adjusted kid who is forming strong relationships with other people. The fact that my toddler loves his daycare teachers, grandparents, aunts, etc. takes the pressure off me to be his everything which is good because between work and a newborn I really can’t be. you hire that person to babysit on saturday nights! i don’t mean to minimize your feelings because they’re totally valid, but i agree with what has already been said- your child has another adult to love that in no way takes away from the love she has for you. i am so grateful to the daycare for teaching my son that mommy can leave and come back, and to feel comfortable with people who aren’t me. Definitely acknowledge the feeling and use any of the great advice here to work past it! It is such a gut level/emotion reaction, though. Even though intellectually I totally get it, there is a bit of a sting when he asks for his caregiver on the weekends, for example. Reading these responses made me feel so much better — I should really print them out and keep them in my wallet. Thank you. I have become mildly obsessed with whether or not to have a third child. Our life circumstances point in the direction of not doing it, but I can’t shake the feeling that our family won’t be complete without a third child. I used to think that was just because, after two beautiful sons, I wanted the experience of raising a daughter, too, but now I am thinking that I would want to do it even if we were told it would 100% be a boy. BUT, here are the life circumstances that make it admittedly ridiculous: (1) We had major fertility issues and if we wanted a third would either adopt or (more likely) use donor eggs; (2) I am 40 years old and would want to wait at least another year before getting pregnant for child-spacing reasons – putting aside the risk of genetic abnormalities (bc we wouldn’t use my eggs), am I just too old? ; (3) I really struggle with the first baby year, I find it very hard and greatly prefer the older ages – in my hardest moments, I think we’re crazy to even consider it; (4) I worry that I can’t handle the chaos of three kids, but this might be influenced by the fact that the two kids we do have are close in age and we are still very much in the thick of it (they are 10 months and almost-3 years old); (5) I have had two c-sections and the idea of being pregnant again/having a third c-section is daunting but doable. I recognize that I have been extremely blessed with two beautiful boys, and I don’t want to press my luck. But I also don’t want to regret not going for a third baby because when I picture us in the elementary/high school years, I love the idea of three kids. It’s those baby years that I’m kind of scared of. I guess I’m not asking for this group to make the decision for me so much as share any experiences you have had that may be similar. Thanks so much! I think that if you can afford the adoption/donor egg process, you should not worry about (1), (2), and (5). Basically, figure out the family you want to have, and, if you want a child, then figure out how to make that happen (adoption or donor egg), within your financial means and taking your health into account. As an anecdote, a good friend of mine had her child at 42 through the donor egg process, and she has a beautiful 2-year-old daughter and seems younger than ever. Wouldn’t adoption (especially adopting a non-infant) solve all but (4)? I would lean towards that in your shoes. Yes, that’s true. I should have said that we were strongly leaning toward using donor eggs over adoption because we wanted more control over the timing, cost, and prenatal care. If you have to consider adoption or donor eggs anyway, couldn’t going for adoption alleviate a number of your concerns? Just a comment, not really advice. Best of luck. Wow, are you me? Also 40, also with two boys, and also wanting a third (ideally a girl). If we do, though, it will only be through adoption. I want to do it, DH think three is a lot and we are stretched. But I also feel like he would love three if the third was here, and I also feel like I will deeply regret not having a daughter. I think about it all the time. No advice, just saying that you’re not alone. Thank you, I appreciate it! Good luck to you! You’re in love with a fantasy. In reality, this is going to be incredibly expensive and draining on you and your family. It’s a nice fantasy. Wrap it up in tissue paper and take it out from time to time to hold. But that’s all it is. I kind of agree. I have 3 kids and the chaos is real. My kids are great and healthy, typical 2,4, and 6 year olds…and life with them and dual full time jobs is full of joy, but also frustration and exhaustion. Pregnancy and the first year with 3 was very tough because pregnancy with 2 young kids is exhausting, and so is having an infant. This year, the oldest started K and it is tough because we’re balancing school and daycare schedules and logistics plus increasing activities. There’s a significant amount of complexity introduced by being outnumbered by my kids, and it’s negatively impacted my marriage and my mental health. Don’t underestimate it (and maybe budget some time and money for therapy and additional help)! For context, I was 32, had always wanted and planned for at least 3 kids, and had a history of easy pregnancies when we decided to go for #3 (and third pregnancy was also uneventful). I wouldn’t change that decision, but it’s been harder than I thought it would be. My husband got snipped and being “done” was emotional for me. MY neighbor, who is done after 4 told me she feels the same way. You can totally go for 3, but be sure you’re prepared to push through the mental, physical, and financial cost, and you’re not just wistful about the end of the baby years. You say you envision 3 school-age kids; would you consider adopting an older child in a few years to complete your family? Thank you, this is also very helpful. I guess I keep coming back to the idea that it’s just one very hard year (or two if you include pregnancy). That it’s so rewarding after that point. But it’s been tough, and I wonder if it makes sense for us. Maybe give it some time. I posted a similar question about six months ago, when my kids were 9 months and 2.5. But since then the feeling has abated a lot — I think partly because the baby has turned into a person, if that makes sense. I am just so delighted by my 14mo now, which in turn has made me so much happier with the status quo of two kids. Somehow now that he is a person with preferences (he likes books! hates shoes! loves dancing! thinks cats are hilarious! ), it has made picturing our two-kid future (family vacations, weekend adventures, etc) much easier. Thanks, this is really helpful advice. I think part of the reason why I’m overthinking this now is because we are outgrowing so much baby gear, and I keep thinking “will we need this again?” Silly but true! I am firmly “one and done,” but getting rid of the baby gear was SO hard for me and totally made me second-guess the decision not to have another child. Same. Also one and done and very happy about that decision, and never someone who got weepy over milestones or endings (like the last time using the bucket seat or whatever), because I was always so glad my baby was getting to the next fun stage. But giving away the baby gear was VERY difficult for me. Way more than I anticipated. We ended up with twins which made me extra certain we’re perfect as a family of 4, but still so hard to give away the baby things. Is there someone you can lend your baby gear to? Get it our of your physical space so you can have the mental space to make a decision. It’s been VERY helpful to me. The specifics of my situation are different, but the sentiment is very much the same. I absolutely do not feel our family is complete with two kids, and yet I can’t imagine being pregnant again, delivering again, going through those sleepless nights again. And we are stretched, so very stretched, by two–financially, emotionally, logistically. But the heart wants what the heart wants. This is such a tough decision and I just wanted to say that you’re not alone in feeling like you maybe want a third, but maybe don’t because of all of the logistical difficulties. I think it’s ok to feel this way, and just know that there is no right answer and both choices will mean giving something up. I like that Cheryl Strayed article about the Ghost Ship, because in the end, all you can do is say goodbye to the decision you didn’t make, regardless of whether it was the “right” or “wrong” one. Some other factors to consider are the sacrifices you will make to your existing relationships. The baby/toddler years typically do put a strain on the marriage and possibly on your dynamic with the current kids and your relationship with this third person is unknown at this point – it may be great, it may not be. All you know are your current relationships. If you both truly feel it is worth the sacrifice, then of course that’s fine, but just something to consider. I think this is a good way to put it. I’m someone who has just said goodbye to this decision. I ache for a third but our first has a rare genetic condition which increases our risks going forward. We’re open to adoption down the road but for even though my heart wants a third I know it would be medically risky and we’re already stretched thin with her medical needs. I acknowledge the ache but have just had to determine it’s a no for now. a cousin just announced she is pregnant with her 3rd and she is 43. She has a 6 year old and almost 3 year old. I personally could not even imagine, but that’s probably mostly because I’m still in the first year with twins…. Anyone in DC know if you can sign up for several Bright Horizons locations’ waitlists at the same time? I thought I heard you could do this, but can’t figure it out. Thanks! On the waitlist form they tell you that you can put down two other centers to be added to. In my experience, they don’t really do it, though. You have to call the other centers and talk to them about getting added to their waitlists. Help me plan the outfit logistics for a client meeting in early May: Flying out at 10am and landing at 5pm. Very nice dinner at 6:30 with the clients, and I do not know whether we will go straight from the airport to dinner, but I suspect that we will. (Traveling with two guys.) I’m thinking of a wrap dress with flats for the flight, change into heels for dinner, bring make-up, a brush and hair dryer for clean-up in the airport bathroom. (You can carry on a hair-dryer, right?) Wrap-dress is pretty comfy and does not wrinkle. I would wear knee-high boots but I’m worried that they are a bit outdated and not nice enough for a fancy dinner. We are flying from one cold locale to another, different cold locale. We have a business meeting in the morning, where I am planning on wearing dress pants and jacket, and then we fly back home that afternoon. This is my first intense fly in and out meeting like this. Any tips? I think you can carry on a hair dryer, but how will you use it unless you can shower? I think the wrap dress and heels sounds good. I don’t think you should go into the bathroom for more than a couple minutes – I personally think it’s much worse to make the guys wait for you while you primp than to show up with slightly less than perfect hair and make-up. If you do your hair and make-up nicely that morning, it should look fine when you arrive, especially if you’re not trying to sleep on the flight. Yes this. I’d plan to touch up concealer, add a swipe of eye shadow, and lip stick. ha, I posted below but I always make them wait for me. I will say I’ve never used a blow dryer in an airport bathroom, though. I don’t really see the point of it? Maybe some dry shampoo, but I usually put my hair up if it’s after a redeye. A daytime flight your hair should be fine. Flats, change into heels or wedges, no knee high boots, no blow dryer way too high maintenance. Personally for a flight of that length I always wear leggings, tank top, comfy bra, and oversized sweater. Then I change in the bathroom/do my hair & makeup/etc when I land. You just never know if your flight will be sweltering and you’re sweating all over your suit, etc. If it is actually going to be snowing, knee-high boots are OK but in May I hope you are somewhere where there’s no snow! The wrap dress is probably fine, but I usually opt for a sheath dress in suiting material + a jacket, dark tights, and heels. You can use the same jacket both for the dinner and meeting the next day. I have a pair of heeled booties that work with both dark tights and my dress pants, that’s what I would pack (and wear flats on the plane as you say). The only time I wear my work clothes is if it’s a less than 4 hour flight and I’m going directly to my meeting with very little time. Wrap dress would be a good compromise though if you do want to dress in your work clothes. I just make my male colleagues wait for me outside the bathroom and put them on “figuring out the rental car” duty (if it’s an airport we haven’t been to before). Goes without saying but don’t check a bag. yeah, I would maybe get a professional blowout before you leave if you want to make sure your hair is perfect. Re: outfit, wrap dress sounds fine, though I think I would probably go with ponte sheath dress, tights, and nice ankle boots just so I wouldn’t have to change shoes. +1 to a blow out pre-flight either night before or morning of if possible. I would not wrangle with a blowdryer after the flight. I’d also probably go with jersey dress of some sort (wrap dresses just don’t work on me) and your jacket for the following day carried or worn on the flight. Wear flats or wedges in the airport, swap to heels, swipe on lipstick or apply additional eye makeup, add some dangly earring and or a nice necklace and go. I’d pack a brush and comb, and either gel or hairspray to fix your hair in your carry on along. I’d also aim that the flats you wear on the plane work with your outfit the following day. I travel a decent amount and I’ve amassed a small but key wardrobe of flat or low heel shoes that I look professional but can also be worn for multi-day conferences, days with lots of walking, and when going straight from the plane to the office. I get why you want the hair dryer to fluff up and if you were traveling alone and meeting others at security, I wouldn’t think it’s too high maintenance at all. But, in this situation, I’d go with dry shampoo. I would have no qualms making the guys wait a few minutes while I did the dry shampoo, sprucing up of make-up, etc. in the bathroom. [First sentence said, though, the dudes aren’t going to know that you’re using a hair dryer to fluff so if it makes a big difference to you then who cares?] And, yes, you can carry on a hair dryer :). Do NOT check a bag, though. I have been fussed at by partners (I was a very young associate) for checking bags on a trip that they deemed it unnecessary to do so. I like Pogo’s strategy if you can figure out something comfy to wear on the plane that is also “business appropriate” in the same way weekend wear at the office would be (aka, no super revealing work out clothes or pj pants). I probably wouldn’t wear yoga pants either, unless my bum was covered by a long sweater and I also wouldn’t wear flip flops or sneakers (maybe “fancy” leather sneakers would be okay, though). Yeah, no way would I be wearing yoga/spandex if flying with coworkers. That is strictly flying on my own attire unless you’re getting on like a redeye to europe with colleagues, which is totally different. I really don’t find sitting on a plane for 3-4 hours all that different from sitting in a conference? Not enough to justify athleisure. I’ll also put in a plug for the small Lo and Sons Catalina. I can easily pack for 2-3 days in that, and the bottom is great for 2 pairs of shoes, or 1 pair and a blow dryer. Sitting on a plane is a lot different from sitting at a conference. The climate control is terrible, the people around you and the plane itself are stinky, and people are liable to spill drinks and pretzel crumbs in your lap. I never fly in work clothes. I usually wear jeans, a long jersey cardigan, and a plain t-shirt, maybe a big scarf depending on the weather. I wear my running shoes on the plane to save space in my suitcase. Most of my male and female colleagues also fly in casual clothing and change at the airport if necessary. +1 to carry-on for a trip of this duration. If you get to the airport and find that your colleagues have all checked their luggage (this frequently happens to me), you can volunteer at the gate to check it through. It sounded like a 7-hour flight (10am to 5pm?) so that was why my strategy was athleisure. Guys from my office usually wear jeans and t-shirts for this length flight, I’ve never seen one of them wear a suit or the business casual dress they will be wearing at our end destination. As you can tell though I’m fairly close with all my (guy) coworkers and we travel frequently enough that it doesn’t bother me. If you would feel uncomfortable, definitely just wear your work clothes on the plane! Unless she’s flying due north or south (unlikely, if both climates are cold) there’s a time change involved. I assumed the 10 am and 5 pm were local times. Its actually 8 hours of travel on the way out as the time change works against us, which includes a 2 hour layover. Wearing a sheath dress all day and into the evening would put me in a cranky mood at about the exact point that I would need to be on my best behavior for the client. I’m totally packing athleisure for the flight home. My hair is very fine, so it barely manages a full day of work, without running through airports and poor climate control of an airplane. I’m going to experiment with dry shampoo before the trip to see if it will breath some life into my hair at the end of the day. Easter question – I have a first grader and 7 mo. Does the Easter bunny also hide eggs for the baby? (Bunny usually just hides plastic eggs filled with candy inside the house.) If so, how does the bunny let first grader know there are also eggs for the baby and what is inside of them? If not, at what age does the bunny start hiding eggs for babies/kids? I know my very inquisitive first grader will have lots of questions and I’m not ready to burst the Easter bunny/Santa Claus/tooth fairy bubble yet, so I want to be prepared with good answers! In my house the Easter bunny only hides eggs for children old enough to find them! Hide eggs for both if you want and use different color eggs for each child. First grader can hunt on behalf of baby. Babies don’t eat candy and the Easter Bunny knows that so Bunny left more stuff in baby’s basket and more eggs/candy for older child. I have 2 brothers and IIRC the bunny hid eggs, and whoever found them got them. This policy would solve the problem for you this year since the baby won’t find any. In future years I think you can ask the older child to help the younger one more if older kid still believes – that’s enough of an age gap that I can imagine some altrusim actually happening. Also had two brothers and this made me laugh. Every kid for him/herself! Well, I should add that our Easter bunny was not wildly generous in general, and probably put larger treats in individual baskets. Finding an egg meant finding an actual hard boiled egg that we had dyed, or a plastic one with a couple jelly beans inside – nothing too exciting. I’ll never forget participating in an Easter egg hung at DH’s (then boyfriend’s) house when we first started dating (in college). He has 3 younger siblings, who were all high-school age at the time. His sister and her friend came downstairs with black paint under their eyes :-) Also, DH’s sister has a hidden talent of finding all the Easter eggs. She had about 20 before everyone else had 5. Ah, so mine are 1/3/6. This year, the bunny will hide one color eggs for the 6 y/o and a different color for 3 y/o. He will leave one egg of each color in the basket as instruction. Baby’s eggs will be a third color and right next to her basket. In our house, Easter bunny uses large eggs for babies (5″? Eggs vs standard 3″? ), and there’s only 6-12 of them. Inside they have Cheerios, goldfish crackers, or teddy Grahams (loose, as we also hide inside). The eggs are also placed on the floor, or easily seen. Not hidden at all. This is a cute idea! I might even wait and do it next year when baby can walk. Maybe I’ll skip the eggs for baby this year and tell first grader that the bunny starts hiding eggs when kid can walk! Similar at our house: eggs are outside in the back yard, and it’s every kid for himself. Most eggs are easily visible from the kid eye level, but a few are legit hidden to make it sporting for the oldest. We do staggered start, youngest to oldest, letting the next kid go when the previous kid has at least ## eggs. Babies that couldn’t walk didn’t hunt eggs, but they did get a couple in their Easter baskets. For those who have taken long flights with kids (mine are 5 and 3) on United, do you recommend purchasing economy plus seats? We will be taking a trip involving two long haul non-stop flights (9 hrs), with a red eye return flight. Economy plus is $450-$600 each way, which seems like a crazy premium. But would it be money well spent? I can’t decide, and flyertalk seems to be peopled with those who fly first/business class rather than normal mortals. My husband and I are not large people, so we don’t need the extra legroom, but economy is so cramped these days, even for people our size. I would never spend ~$500 each way for it. If you can get it for $50-100, it might be worth it, for you guys more than the kids (they really don’t need any extra legroom). (I *would* pay $500 – or more – for a first class seat with a layflat bed, but that’s very very different than just a bit of extra legroom). I always do economy plus when I travel by myself, but with my kids I don’t. I steal their legroom if I need it. Would be nice but so expensive for four tickets. I only do it when it’s the only way to book seats together because I just don’t mess around with trying to trade seats last minute. I’m sure if you do it, you’ll be glad. +1 we did it for an international trip we are taking, but it was because it was the only way to choose seats. I agree – the cost x4 is crazy. The only reason I am considering is b/c I used miles to book 3 of the 4 tickets. But it sounds like my initial reaction (no way, we don’t need the room) is consistent with actual experiences of others. Thanks! Not worth it for kids who need their own seats, in my opinion. If they were still lap infants the extra space is great for letting toddlers stand up in front of you, but at 3 and 5 they don’t need that. Also, this is totally dependent on your kid, but I love having mine in carseats on long flights and find the hassle of getting them through the airport to definitely be worth the payoff of having them on the plane. I’m a low-grade frequent flyer and usually get American’s version of economy plus (main cabin extra) for free. It’s not something I would pay for. The main perks are early boarding (which you should be able to get with little kids anyway) and extra legroom. I’m 6′ tall and although the extra legroom is nice, it’s not hard for me to do without it. I don’t think it would matter for the kids, since they’re so much shorter than adults. I just flew United w/o the kiddos on a 4-5 hour flight and the economy plus was disappointing relative to other airlines (like Alaska, which I think is great). United was basically just a couple inches of legroom…no included drinks (fine, but a little annoying), and a big one was no early boarding – you can separately buy early boarding, which we did for the return flight, so do better than we did and read the details and know what you’re buying! Generally I like to buy up even with kids for the reasons noted above like easier to get seats all together, but for United it feels less worth it. My 6+ month old has been eating baby food for a few weeks now, and I have yet to get the point where he gets full and refuses to eat more. I eventually just stop feeding him, but it seems like he’s still hungry and would eat more. He’s only had oatmeal cereal and fruit and vegetable purees so far, but I think by now he’s tried pretty much all of the stage 1 foods. Should I try something more substantial like yogurt or scrambled eggs? Ped said he can eat whatever, except honey, of course. I was trying to make the transition from baby food to regular food more gradually, but maybe we just go for it. He’s pretty average height and weight, if that matters. Are you feeding him right after nursing/formula? I think at that age they recommend doing milk/formula first and then supplementing with solid food. I’d be cautious of feeding him too much solids at once because it can take their guts awhile to adjust (our daughter had horrible painful gas for weeks after we started solids). Yogurt and scrambled eggs are good things to try though! He generally eats cereal with fruit in the morning (at daycare during the week) and then a puree in the evening. He’s EBF so far, so maybe I should move solids closer to after nursing so he’s not ravenous. That’s a good idea. The gut issues/gas is my concern. I don’t want to jump in with too much too fast and cause issues. I’ll slowly start adding in more “real” food and see how it goes. Just go for it. One of my three was like this. He was totally obsessed with solids and loved them from day one. At that age, my kid spent the whole day crawling on the floor at day care and was perpetually ravenous. Eggs and whole-milk yogurt are good because they provide protein and fats. Mashed banana, avocado, and sweet potato are also worth a try. awww, fun take a lot of pictures!! I say keep going for it, sounds like he’s a growing dude! Yogurt, refried beans, eggs and hummus are big hits for us that fill up the little belly! Yes, I would keep feeding if still hungry. My current 8 month old is VERY hungry but gets super fussy with purees and mostly wants endless tiny tiny bites of whatever we’re eating that’s soft enough. I wouldn’t overthink it too much- if baby’s still getting a lot of milk/formula, you can try pretty much anything if soft/small enough. As others have mentioned, avocado, yogurt, sweet potato, tiny egg pieces, are all pretty filing. Yogurt mixed with peanut butter is a hit around here. It’s still so odd to me that he can have PB at his age! That’s a good idea to mix it with yogurt. Any recs for good baby yogurt? We just give him regular plain yogurt. Yes, plain full-fat yogurt is the best. “Baby yogurt” is marketing and most of what’s available is loaded with added sugar. Regular plain yogurt is much healthier than “baby yogurt” which is loaded with sugar. If your baby doesn’t like plain yogurt, you can stir in whole fruits or fruit puree. Does anyone have a kid who wears SMOs or AFOs? What do your kids do for dress shoes or summer? I’ve come to hate easter and christmas because I can’t find any cute shoes that accommodate DD’s SMOs and then she ends up wearing her new balance shoes and nasty relatives make comments about why I couldn’t put her in nicer shoes with her nice dress. Also last summer her feet would get sooo hot in the SMOs, plus socks, plus shoes. Anyone have any tips? i dont know much about the physical requirements, but can you just put her in sandals or jellies such that the SMOs are visible? then relatives would (hopefully) keep their mouths shut and she wouldnt feel like shes hiding anything. There just aren’t a lot of shoes that fit them because they usually have to be wide or xtra wide shoes and most sandal straps are too small to fit them. I probably worded my question poorly. I’m not trying to hide them, I’m just trying to find shoes that fit them because it’s pretty much impossible aside from extra wide sneakers. Oh easy. Make other holiday plans. I ain’t got time for haters. Yeah I would not be spending one second with people who thought it was ok to snark on my kid’s medical devices. DD1 has an extra wide foot, so we probably own the exact same New Balance sneakers because they are the only ones that reliably fit. For ‘dress up’ we can get away with Stride Rite mary jane type shoes, as long as the strap is velcro. The ones with the buckle don’t work, and the sandals are always too tight. I’ll reply with a link. Not really looking for advice, just venting I guess. I have two really close mom friends and they are both moving out of my life. One is moving cities to be closer to her family, which I get, and the other has decided to try to work it out with her husband who’s cheating on her (he has said he will not stop cheating on her and she’s decided she is ok with this? So I don’t really think I can stay friends with her). I just feel so sad and lonely and exhausted at the prospect of starting over trying to find mom friends. I empathize about your friend who’s moving away, although you can still be good friends with someone who isn’t local. My three closest mom friends live on the other side of the country (where I used to live) and although they can’t be backup care, etc., they’re an invaluable source of support. I moved locations, but I didn’t move out of their lives, nor they out of mine. But whoa to dumping your friend with the cheating husband. I understanding not wanting to stay friends with someone who is lying or deceiving their spouse. But your friend is not doing anything morally wrong or harmful to anyone else here, even if her husband sounds like a real jerk and she’s accepted his jerkiness. This is presumably a very hard time in her life, and the last thing she needs is a good friend ending your friendship. Please please rethink this. I completely agree. Why are you dumping your friend with the cheating husband? Maybe I could understand if she were the spouse doing the cheating, but as is, I don’t understand why you don’t want to be her friend any more. Especially if you are lonely and mourning the loss of her friendship! why can’t you stay friends with somebody who is going through a rough time? seems mean and weird to cut them out of your life. Why is it your business if she’s decided to stay with her husband? As much as you may think you know, the only people who know what goes on in a marriage are the people in it. Maybe they’ve decided to have an open marriage but she doesn’t want to share this. Maybe she doesn’t want to Garden anymore so she’s decided her husband can garden elseware. Maybe they can’t financially afford a divorce. I don’t know why you would dump your friend though. I don’t understand why you can’t stay friends with the second friend. Having a friend move is rough, but the other one I think you should reconsider. On the second friend, I kind of get it. I mean, I don’t think you should dump her solely because she stayed with her husband, but if she both stayed with her cheating husband and continued to complain about her cheating husband? Honestly, I have too much of my own stuff to deal with in life to be the support system for someone like that. Maybe that’s the scenario, maybe it isn’t. I’d try to make the friendship work if she wasn’t dumping it on you, but I’ve had friends who continually make the same bad choices and expect me to be there to pick up the pieces, and it’s emotionally exhausting. I had time for it ten years ago when I was single. But I’m married with three kids and right or wrong, my limited availability for friend time would not put her high on my priority list. I kind of get it, too. Maybe it’s not fair, but I can see why this friendship dynamic would be hard to keep up with, particularly if OP has had a friendship with both the husband and the wife. It also can be very uncomfortable to constantly be around someone else’s marital discord. I don’t know that I’d go as far as “dumping” the friend, but I can understand needing some distance, which is inevitably going to affect the friendship. Infidelity: There are ramifications beyond the couple involved. Re: the friend who is staying with her cheating husband, perhaps a reframe and a bit of information. If he is cheating, there may also be emotional abuse directed her way. (And no, you would not necessarily know about it.) On average, it takes someone 4-8 tries of leaving before they actually manage to end an abusive relationship. Perhaps you can be a source of support as she works through whatever is going on with her? Know that “just leaving” is not easy, and people need multiple tries and so much support to end a relationship. Partner and I have discussed trying to conceive this fall. I am on a number of medications that need to be stopped before we try (birth control, anti-anxiety pills, doxycline for rosacea). I am having a LOT of worry about how my body will react when I stop these medications. I know I can’t be the first one to have stopped taking medications that improve their quality of life in order to try to conceive. How have others managed this transition? Did your expectations of how your body might react match reality? Or were you more concerned than you needed to be? I have relied on the drugs I currently take for ten years, and it’s frightening me that I don’t have a “baseline” of what my body is like without them anymore. Ask your doctors before you stop taking your anti-anxiety medication. A lot of SSRIs are fine to take while pregnant, and even if yours isn’t, there might be some alternatives you can switch over to ahead of being pregnant. They aren’t considered 100% safe, but you have to weigh these potential risks against the risks of being overly anxious and stressed while pregnant. Yeah pretty much everyone I know who takes anti-anxiety meds stayed on them while pregnant. Agreed. Also FWIW, I was not taking medication when I got pregnant but found that my depression/anxiety was actually lower while pregnant. I can’t speak to the BC or the anti-anxiety, but I went off antibiotics for deep painful cystic acne (and topical steroids for psoriasis). Not going to lie, the acne was pretty terrible, particularly with the pregnancy hormones (but now 6 months post weaning and it’s way better than it was – I haven’t started taking anything in part because I haven’t really needed to and in part because we want to TTC again soon). My psoriasis flared something awful and in new places (all over my face, elbows, hands). But I took the view that our bodies are resilient and confirmed with my doctors that I wasn’t doing any permanent damage to my body, as uncomfortable as I was (and I may have studiously avoided mirrors for a long time). For something like anti-anxiety where (my impression at least is) that that can really mess you up if left untreated, I would want to have a serious conversation with my doctor about what you can do or take (e.g., talk therapy, different pregnancy OK meds, etc.). In my experience, there is a continuum of meds where we have no evidence to support it being OK (because we don’t do clinical trials on pregnant women), but the science seems to indicate it should be OK, vs. meds that are a hard no, known to have birth defects. The benefits to maintaining certain meds may outweigh the risks – but that’s a question you’ll need to have with your doctor. This is your anxiety talking and you need to work through a plan to deal with your meds and your anxiety and pregnancy with your doctor. I don’t think that’s necessarily true re: that this is her anxiety talking, and I worry that this de-legitimizes the OP’s concerns. I have never suffered from clinical anxiety, but I was really worried about how my body would react when I needed to wean off of a drug I had been taking in connection with frequent fainting episodes in anticipation of TTC. I worked with my doctor to come up with an alternative treatment plan and everything turned out fine, but it was really scary to face the prospect of going back to a life where I would suddenly faint unexpectedly. +1 to the comments re: anti-anxiety (depends on the class of drugs of course), but absolutely discuss w/ your doctors. On stopping BC, it was as hard as I thought it’d be, because I have PCOS. I think from when I took my last pill to my first period was like 78 days or something. The pain w/ periods was as bad as I remembered it from teenage years. My migraines were as crippling. However, I’d never been diagnosed with PCOS until TTC, so that was a relief to find out: yes, your hormones are messed up! I’ve heard similar stories from women with endometriosis who had never been diagnosed as a teenager – they’d managed by taking BC, and then when TTC were diagnosed. If you had normal periods before BC, I would expect them to return more normally. I had taken birth control from age 17 until 35 when I went off it so we could TTC. I had ovarian cysts that were surgically removed and bc was the only option I was presented with to prevent re-occurrence. I had never had regular periods as a teenager and didn’t when I went off BC. That made TTC a bit more tricky and I definitely felt like a bit of a crazy person for the first few months off BC. It wasn’t unmanageable but I noticed a difference about myself. The more difficult thing for me was my skin. I had bad acne both more superficial and deep cystic acne before going on BC and was considering Accutane but BC made it much better so never did the Accutane. All the acne returned when I went off BC and it spread to my chest and back. There aren’t a lot of pregnancy friendly acne options and those I tried ( I did not try everything) did not work for me. So going to work with really bad acne has been hard both because it looks terrible and some days it really hurt. In my third trimester it has gotten a bit better and I can mostly cover it with makeup now, but I have some pretty significant scars that I’ll look into treating once its safe to do so. Still these are minor frustrations and at 35 weeks now I’m just looking forward to having a baby! – We have a big basket for stuffed animals but it’s constantly overflowing. – Something to corral the accessories that come with her princess dolls and Barbies. – Something that holds all her doll clothes. – Grandma made her tons of tiny pillows and blankets for her dolls. They are ADORABLE, but it is creating a giant mess. – Her bookshelf would be a good choice for toy storage, except it’s completely filled with books. Relocating this stuff to the play room is probably not going to happen, if I’m being realistic. These are the most special things that she wants close by, not downstairs where the bigger toys are. How do I manage this without having a million baskets all over the floor? Or am I dreaming? I swear my older kid’s room (boy) was not this bad in preschool but it’s possible I have amnesia. Oh, and I’m not looking for DIY picture-perfect Pinterest solutions. Ready-made is where it’s at for this stage in my life. Kallax shelves (ikea) with baskets? A hanging net for stuffed animals? We usually go for the “big bin we can dump everything similar in” approach. Sounds like too much stuff to me. Can you take some of it and put it in a box in the basement (or wherever) and then rotate in a few a months? Then you would only need *half* a million baskets. For doll clothes or doll pillow and blankets, what about a cloth hanging shoe thing for the closet or the back of the door. As a child, my stuffed animals were in a triangle net thing in a corner of the wall that I could reach if I stood on my bed. As for books, I moved my daughter’s books to wood crates on the floor (I was worried about tipping risk), so you could do that for the books and then use the bookshelf for other things. +1 agree to the one big bin for everything. With our daughter, we tried getting separate bins for separate things, but she doesn’t have the patience or brain power to sort. So we tell her that the middle of the floor and the path from the door to the bed needs to be clear and other than that we don’t care where she puts things (I think there was even a point where we drew a box with painter’s tape of the area that needed to be kept clear.). once a month (or when we get tired of it) or so we get a trash bag and everything in the “clear area” goes in the trash bag. We don’t actually throw it out, just stick out of sight for a while. It surprising how little she misses the stuff. I’ve gotten a few of the less twee cardboard storage boxes at craft stores and use them to corral the smaller items like doll accessories, craft supplies, and random collections. I’ve seen them a the big box craft stores and places like Tuesday Morning. The real solution is less stuff. But if you don’t want to get rid of it…. I took a page from daycare and got an ikea trofast + bins that I labeled with pictures of the stuff that is supposed to go in them (eg, magnatiles, wooden blocks, doll stuff, things with wheels). The idea is that kiddo takes out 1 bin at a time, and then just throws everything back in the bin to put it away. It doesn’t work perfectly, but it’s an improvement. I’d call everything you listed “doll stuff” and put it in the same bin (if it fits). we keep all the stuff you described in my daughter’s 3-drawer nightstand. we also have a lot of storage space in her closet thanks to installing the elfa system with a lot of shelves. We are getting by well with keeping all the stuffed animals on the bed (there are approx 18 thousand) and utilizing a bedside table that has 3 drawers for treasures. We don’t allow many toys in the bedroom, so ymmv, but those extra special treasures were everywhere and the bedside drawers are helping! I recommend How to Raise an Amazing Child the Montessori Way for inspiration on toy organization. I rotate toys by stashing many in the basement. I also set aside toys my kid is growing out of.